Niche-Gifts.com offers high quality made-for-me niche' gifts. Let your decorations take center stage! We've designed the Douglas Fir collection with a little extra space between branches to let you showcase many, many ornaments - and to make decorating easy. The vibrant, light green foliage brings fresh energy to your holiday decor. If you're seeking a tree for retail display, the Douglas Fir is the ideal choice. 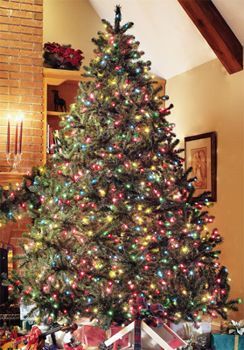 Look at our picture of the 7.5' Medium Tree below for a decorating example! Ideal tree for displaying all your ornaments. Flame-Retardant for Fire Safety in the home. Easy, Stress Free, single person assembly. Needles are beautiful and crush-resistant. Our trees have radiant, even lighting. Our lights locks with twist proof bulbs. Light shines with rich color and intensity. If a bulb goes out the others remain lit.